Why on earth, and how on earth do you have so many oils?? Every time someone comes to my house the first time, they ask me this question. I explain that I use them for so many purposes, saved so many trips to the pharmacy, and ditched SO many bottles of chemical-filled yuck in my cabinets because of these colorful bottles of problem-solving drops from nature. They are my toolbox. They are my go-to's. I've ditched and switched and am never looking back. That's the "Why." And the "How"? Well... I definitely didn't go broke paying for them, if that's what you're wondering. Here's my secret: ESSENTIAL REWARDS. If you love Young Living’s oils, there is no reason to not earn points back on what you’re spending, right? So how do I have so many oils? 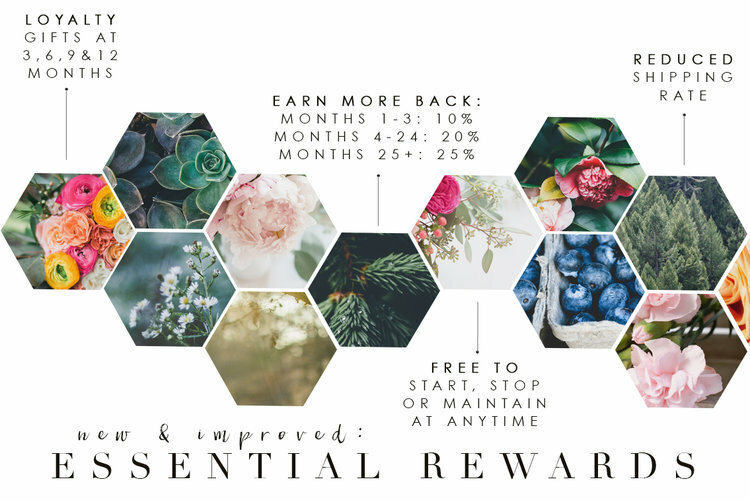 I have racked up SOOO many $$ back from this program, that whenever I feel like indulging myself, I get to order whatever oils I want at no cost. AND - I get bonus, promo oils every month when I spend either 100, 190, 250 or 300. This is really nice when a friend or family member wants to place an order through me, since it means I get points back AND free oils! Did I enroll in this right away, when I got my Starter Kit? No. And I kicked myself for it. Typical, skeptical me...I thought the program was a gimmick that I would get locked into, and didn't enroll in it when I became a Young Living member. And thus, I missed out on $30 of points back, and 3 free bottles of the promo oils that month. It's amazing. I mean, what credit card/frequent flyer/loyalty program gives you 20% back in points? Not my Discover card, mind you. Though I'm grateful for their program, a piddly 5% is all I ever get. And even that's only when I shop at certain places (usually ones I rarely even need to frequent...like movie theatres or home improvement stores). Click here for some examples of what 50PV orders could look like. If your goal is ridding your home of the harmful and replacing it with the healthful and helpful, why not earn points back while doing it? This is the way to revamp your home and lifestyle sustainably, you guys! Instead of buying your toothpaste and laundry soap at Target, and killing your endocrine system and nervous system softly, buy your stuff through Young Living instead and get rewarded... generously! Small steps in the direction of healthy, non-toxic living will add up to huge changes for the good of your body and the bodies of all your family - even those precious future lives who haven't yet arrived! Every decision counts. You can do this! Go to your YL Virtual Office and click "Essential Rewards" on the left side of the page. Then create your $50 order. That date will be your monthly processing date. To redeem your points, you place a separate order from your monthly order by clicking "Quick Order" on the left side of the page, or, by adding items to your shopping cart. HINT: Make sure to create a reminder on your phone each month for that day of the month. Set an alert for the day before, and make sure you UPDATE your order to whichever products you need that month...otherwise it will ship you the same stuff as the previous month! Setting up the "PV Assistant" will help you keep your order at the right PV amount to stay enrolled, in case something goes out of stock. It’s like Amazon Prime - but better! And it’s only for Essential Rewards particpants! Click here for details.